If you’re a fan of E Ink displays, Oaxis has got you covered. The company released their cases for iPhone 5/5S last year, and are about to launch the same case for the iPhone 6 and 6 Plus. 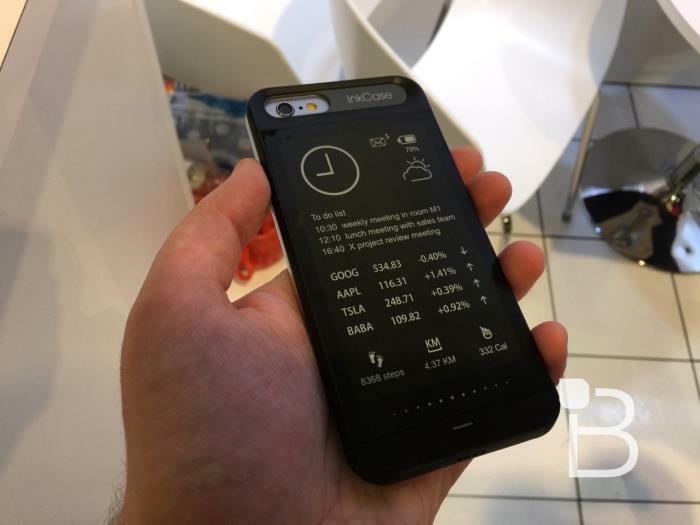 The company showed off a prototype at CES 2015 in Las Vegas, and works in a similar fashion as their previous case, offering a second display for your handset while maintaining the slim form factor of the iPhone 6. It may not be as slim as the iPhone 6 and you’d definitely feel the weight, but you should be able to live with it if you want an e-ink display. It connects with your device via Bluetooth and using it is extremely simple. The case is not available at the moment, but InkCase for iPhone 6 is expected to hit retail in May. As for the bigger iPhone 6 Plus, it’s expected to launch in the second half of 2015. The back of the case can be used to read e-books, view photos, and even add widgets to find out information about weather, time, your to-do list, stock prices, and health-related metrics. More details will be released soon, and we’ll update you as soon as the company announces an official availability date. Have a look at our top tips on how to improve iPhone battery life.